The Wheel of Life...called the Bhavachakra in Sanskrit...represents the cycle of birth and rebirth and existence in samsara, the four nobel truths and the eight fold path of Buddhism. 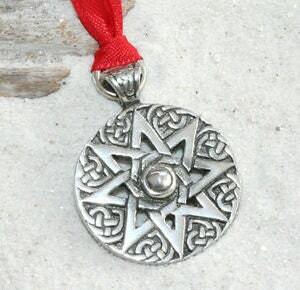 The 8-Pointed Star or Octagram corresponds to the Wheel of the Year and the 8 Sabbats of Wiccan and Pagan traditions. It is representative of the cycle of time and the power of regeneration and return. 8 is also the number of harvest, allowing you to reap the seeds you have sown in the past and gain from your projects and learning.